Painted on 14 January 1950. M. Loreau, ed., Catalogue des travaux de Jean Dubuffet--Paysages grotesques, Lausanne, 1965, fascicule V, p. 82, no. 177 (illustrated). Frankfurt, Schirn Kunsthalle, Jean Dubuffet, 1990, no. 73 (illustrated in color). Martigny, Fondation Pierre Gianadda, Dubuffet, March-June 1993, p. 55, no. 25 (illustrated in color). Painted in 1950, Les rencontres (Paysage avec trois personnages), perfectly encapsulates Dubuffet's love of the desert while showing how much its influence helped consolidate his artistic style. Dubuffet's entire thinking and philosophy had been altered by his three trips to Algeria during the late 1940s. Through his experiences there, Dubuffet's art began to tap into a raw sense of existence, of nature, and a clearer means of perceiving the world. Casting aside the teachings that had shaped his view of the world, casting aside the artistic skills that had informed his pre-War, modernist art, Dubuffet now managed to convey the desert and its inhabitants with a shocking immediacy. The arid atmosphere is conjured up as much as the emotion of the people in the image. This is not an image to be appreciated on formal and aesthetic grounds, but is instead a direct message, an assault on the senses which circumvents Western expectations and boldly throws its image into the viewer's space. In Les rencontres (Paysage avec trois personnages) the desert which so marked the artist almost appears as a character in its own right. Visiting the communities who lived there, Dubuffet saw the desert not as a flat and featureless landscape but instead as the home of many wondrous peoples, a place of constant activity and interest. The enthusiasm that this work translates shows that Dubuffet's experience there was not that of a detached outsider, but that of someone who grasped and enjoyed life there to the full. He was not merely an itinerant observer, but was intent on living life in a non-Western style. The extent to which he succeeded is visible in the joyous figures and the fervor with which the artist clearly painted them. Despite the two-dimensionality of the figures, the desert does not provide a mere backdrop, but is instead the surroundings for the three characters who have met there. These people are portrayed with a palpable enthusiasm, giving them a sense of excitement and joy that is wholly translated to the viewer, truly embodying the extreme happiness at the fortuitous meeting in the desert. In this, the artist is immersing himself in the culture of the desert, rather than looking at the place and the people through Western eyes. Dubuffet has adopted what he termed "Anticultural Positions". This was the title of a lecture the artist gave in Chicago in 1951, the year after Les rencontres (Paysage avec trois personnages) was painted. In it, Dubuffet attacked Western notions of beauty and thought, and the restrictions they imposed on any understanding of the world. In going to the desert, Dubuffet had sought to strip away the Western filter through which he saw the world. While in the desert he made numerous watercolors and drawings, many of which later served as the basis or inspiration for oils executed on his return to Paris. Most of these were executed by and during 1949, whereas Les rencontres (Paysage avec trois personnages) marks an interesting reprisal of the desert theme, being one of two such works executed in January 1950. "One of the chief traits of the western mind is its habit of ascribing to humankind a nature quite different from that of all other creatures, a refusal to identify our nature with, or compare it in any way whatsoever to, such elements as the wind, a tree, a stream-- except in jest or in poetic figures. Western man despises trees and streams. He hates the very thought of being like them. The 'primitive' however loves and admires trees and streams. He takes great pleasure in resembling them. He believes in an actual similitude between a human being, a tree, and a stream. He has a very strong sense of the continuity binding all things, especially humanity and the rest of the world. These 'primitive' societies certainly have a greater respect than western man for all the creatures on the earth. They do not see humankind as the lord of other creatures but merely as one of them" (J. Dubuffet, "Anticultural Positions", 1951, quoted in Jean Dubuffet: Towards an Alternative Reality, M. Glimcher, ed., New York, 1987, p. 127). It is in line with this that Dubuffet presents the desert not as a horizon or a background to the figures, but instead as part of the group. The characters are immersed in the desert as Dubuffet is in his subject matter. Unlike most Western art showing people, here the figures are not the sole focus--they do not stand supreme in a dominated landscape, but are instead in an area with which they are at one. They are like their surroundings, and are viewed and represented with the same visual idiom and appreciation as the world they live in, disrupting, or rather disregarding, the entire Western landscape tradition. 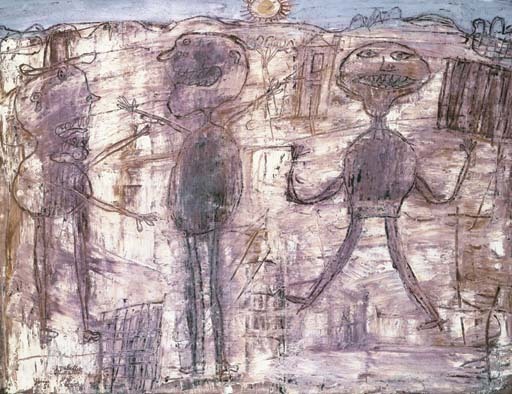 The highly textural method with which Dubuffet painted Les rencontres (Paysage avec trois personnages) emphasises this: the tactile sense of the paint, with the lines carved out of the thick impasto, give a sense of the people being made of the same matter as the desert, organically growing out of their surroundings. To create the various delineations, Dubuffet has scratched through the blanched surface, revealing darker colours underneath. In the same way that the characters seem part of the same organism as the desert, the painting itself appears to have been organically created, the thick impastoes reminiscent of the primordial ooze. With Dubuffet's combination of this texture with the verve of the scene itself, Les rencontres (Paysage avec trois personnages) taps into the stuff of life itself.